WASHINGTON— The U.S. Environmental Protection Agency released multiple scientific assessments today that found commonly used neonicotinoid pesticides can kill and harm birds of all sizes. Separate analyses also found the pesticides pose significant danger to aquatic invertebrates, which play a crucial role in supporting larger ecosystems. The troubling assessments come on the heels of earlier EPA analyses and thousands of scientific studies that have identified substantial risks to pollinators and aquatic invertebrates from this class of pesticides. In today’s assessment the EPA found that risks posed to certain birds from eating neonic-treated seeds exceeded the agency’s level of concern — the level at which harm is known to occur — by as much as 200-fold. In addition to killing birds, a recent scientific study also found, neonic pesticides significantly impair the migratory ability of seed-eating songbirds. Today’s analysis found that if neonic-treated seeds make up just 1 percent to 6 percent of a bird’s diet, serious harms could result. Europe has instituted a temporary ban on neonicotinoids based on their harms to pollinators. Canada’s pesticide regulatory agency has recommended banning the most widely used neonicotinoid based on harms to aquatic ecosystems. Earlier this year a common-sense rule that would have placed limited restrictions on neonics when commercial honeybees were present in fields was changed from mandatory to voluntary. The EPA is currently in the process of reanalyzing neonic impacts to humans and the environment and says it will decide whether to reapprove their use by the end of 2018. 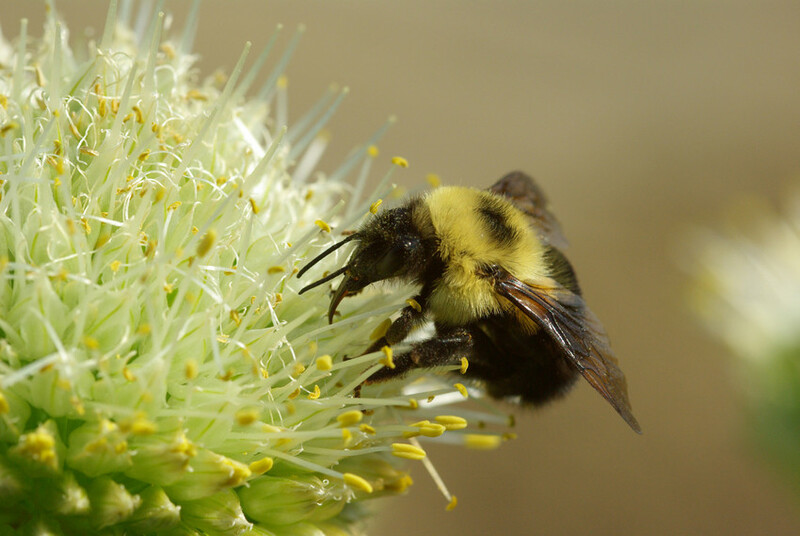 Neonicotinoids are a class of pesticides known to have both acute and chronic effects on honeybees, birds, butterflies and other pollinator species, and they are a major factor in overall pollinator declines. These systemic insecticides cause entire plants, including pollen and fruit, to become toxic to pollinators; they are also slow to break down and therefore build up in the environment. A large and growing body of independent science links neonicotinoids to catastrophic bee declines. Twenty-nine independent scientists who conducted a global review of more than 1,000 independent studies on neonicotinoids found overwhelming evidence linking the pesticides to declines in populations of bees, birds, earthworms, butterflies and other wildlife. Wild bee photo by Ano Lobb. This image is available for media use.